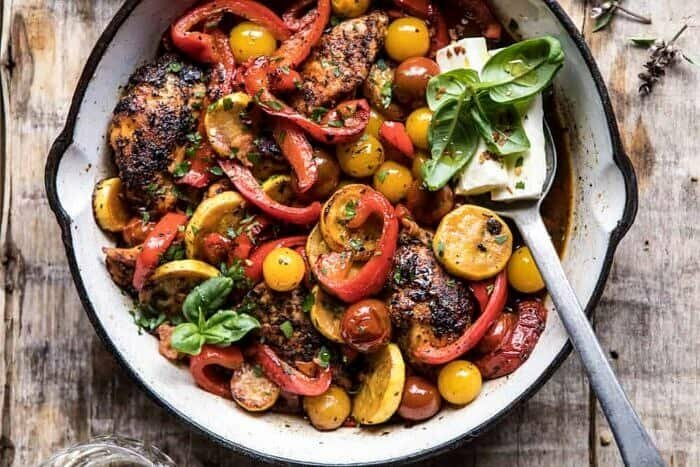 Skillet lemon pepper chicken with all the garden veggies! Herb and pepper seasoned chicken with blistered veggies, all cooked together in a skillet with a white wine pan sauce. A delicious skillet chicken dinner that’s ready in thirty minutes or less! You guys. It’s already Wednesday. Don’t you just love a short week? With the holiday on Monday, this week is truly flying by. I started the week off with a mass amount of cooking and that’s basically how my weeks will be going from now until mid June. OK. Well, I take that back. I have about two weeks ahead of bulk cooking and photographing, peppered with a few days of filming videos…plus my usual writing, emailing, and insta-storying in between it all. It’s going to be a lot, BUT the pay off will be great! What’s the pay off? We are heading to the Caribbean in the middle of June for a family vacation and I am pretty excited about it. I haven’t been somewhere tropical in what feels like ages. I’m more than ready for that ninety degree Caribbean summer heat, clear blue water, palm trees, and tropical drinks. Like so ready. Can I go now?! Let’s get back to this chicken, shall we? OKAY. Some of my favorite recipes are the ones I end up throwing together on a moment’s notice with ingredients I have on hand. I don’t know why this is, but most of the time these recipes turn out mouth wateringly good. I mean, don’t get me wrong, this doesn’t always happen, but more times than not, I’ll end up loving whatever I just quickly threw together. This happened to be the case with this skillet chicken dinner. Before I left for LA last week, I threw this recipe together in an effort to use up the raw chicken and fresh vegetables I had on hand, plus a ton of herbs from the garden. I put everything together in a skillet and this is what I got. Generously seasoned lemony, peppery chicken, pan blistered veggies, and a white wine pan sauce that’s good enough to dip your bread into…which you should totally do. And done in thirty mins. YESSS. I seasoned the chicken with basically the entire contents of my spice cabinet, lots of fresh basil, parsley, and lemon zest. It might seem like a lot, but go with me on this. Promise, you will love it, and very much enjoy eating non-boring chicken. You will, you will! Now sear the chicken, add your veggies, then a splash of white wine, simmer for a bit, make sure that chicken is cooked, and then done. Finish this skillet off with feta cheese (you must) and a handful of fresh herbs. And that’s what I like to call super simple, but super good. Personally, I love serving this dish with plenty of toasted bread for soaking up that pan sauce, and maybe some quinoa or rice as well. A glass of wine would be great too. Just saying. I already see this meal becoming a staple in my kitchen over the next few months. Not only does it take just thirty minutes, but it requires zero oven time and uses vegetables that I have growing in the garden (or green house really, but garden sounds so much better). Making it perfect for busy nights when I have no time to cook, and nothing in the fridge (well that part pretty much never happens). Also, who else is excited for their summer gardens? Ours just has herbs right now, but we have lots of bell peppers and cherry tomatoes planted that should be arriving come in August. Can’t wait! Until then, it’s herbs from the garden, veggies from the market, and skillet chicken for dinner every week from now until September. 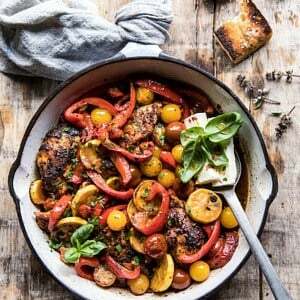 If you make this skillet chicken, please be sure to leave a comment and/or give this recipe a rating! I love hearing from you guys and always do my best to respond to each and every one of you. Oh, and of course, if you do make this, don’t forget to also tag me on Instagram so I can see! Looking through the photos of recipes you all have made is my favorite! 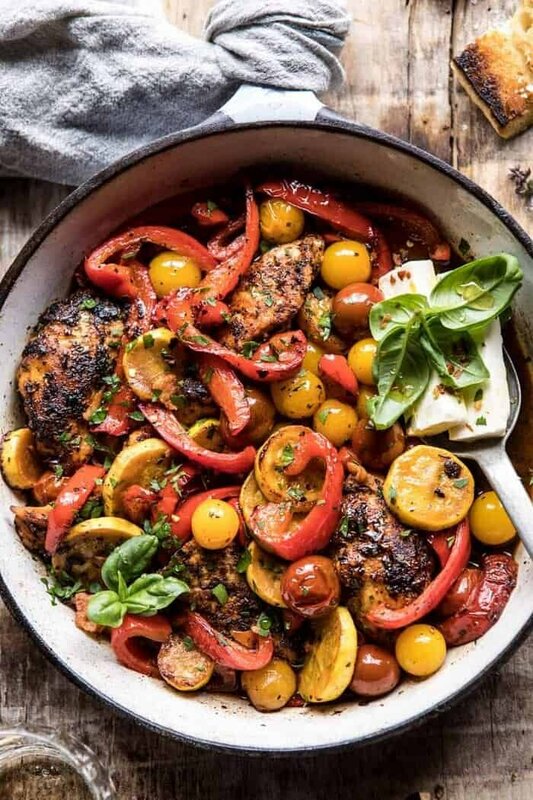 Skillet lemon pepper chicken with all the garden veggies! Herb and pepper seasoned chicken with blistered veggies, all cooked together in a skillet with a white wine pan sauce. A delicious skillet chicken dinner that's ready in thirty minutes or less! 1. Toss the chicken with 2 tablespoons olive oil, garlic, paprika, onion powder, cayenne, parsley, basil, lemon juice, and lemon zest. Season generously with salt and pepper. 2. Add the remaining 2 tablespoons olive oil and chicken to the pan and sear on both sides until golden, about 5 minutes per side. Add the peppers and zucchini and cook another 5 minutes. Next add the tomatoes, shake the pan and cook for 1 minute. Reduce the heat to medium low and pour in the wine. Simmer the chicken for 10-15 minutes until cooked through. 4. Serve the chicken topped with feta. Drizzle any remaining pan sauce overtop, and top with basil. EAT! 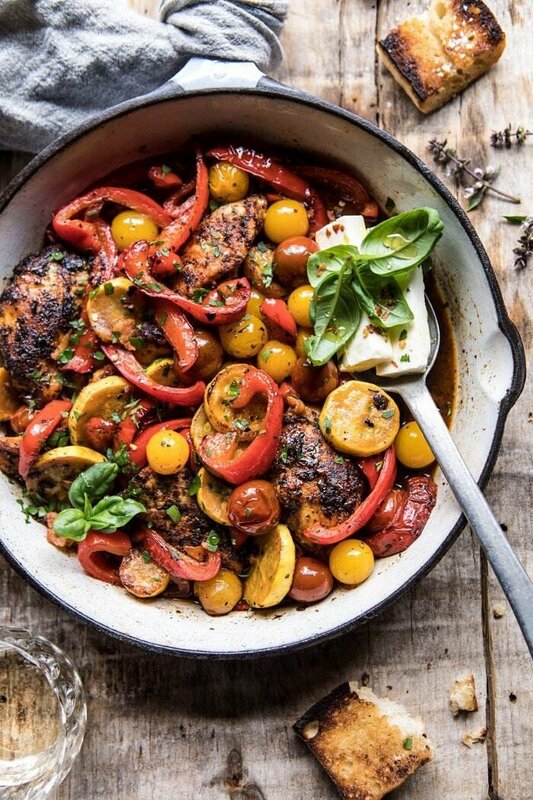 Skillet chicken for the win! 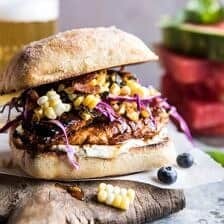 Spicy Maple Grilled Chicken Sandwich with Smoky Bacon Corn. So inviting and vibrant and healthy ! Thank you so much ! 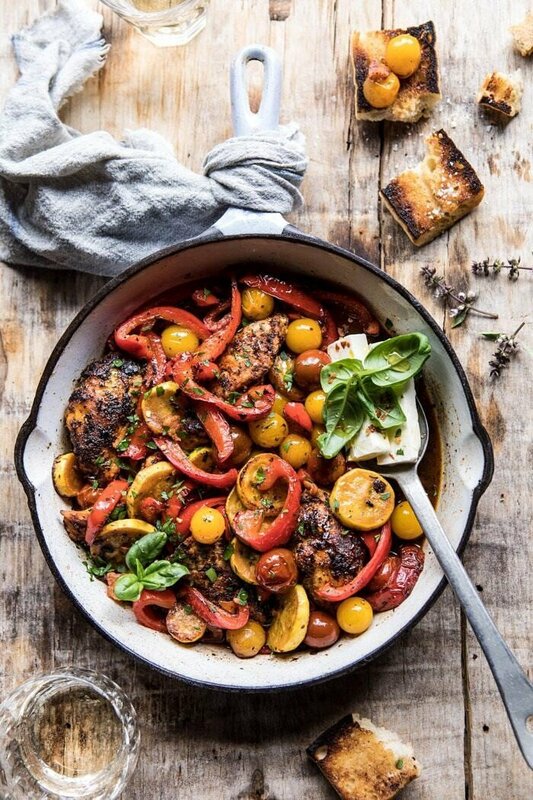 Look’s like this will be dinner tonight as I have EVERYTHING in the ingredient list and I had no plans for the chicken in the fridge and now I do! Perfect!! I hope you love this Amanda! I love non-boring chicken. Bring on all the herbs and spices!! This looks delish. Right?! Its the best! I hope you love this Natasha! It seems to be delicious, the dish is very beautiful. I’ll do it here. Thank you for sharing the recipe. I am glad you like this! Thank you! What type of skillet did you use? Hi Ingrid! I use a Staub cast iron skillet! I hope you love this! 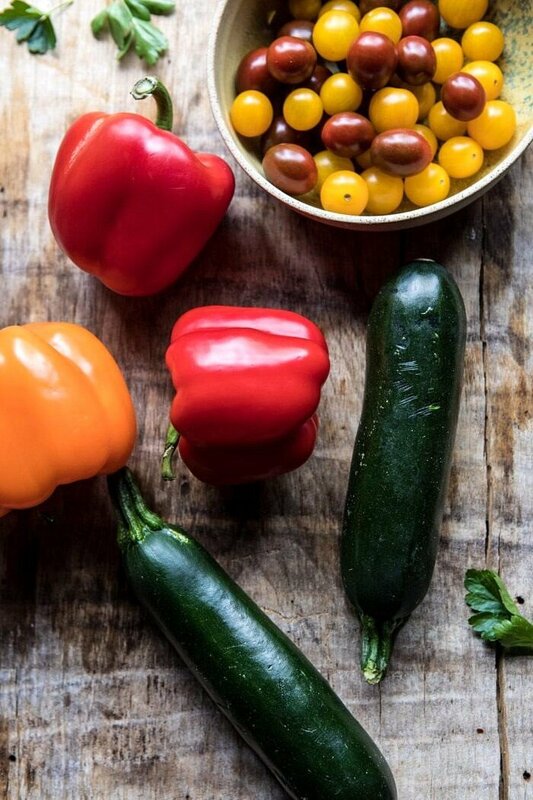 So excited about this recipe…I planted cherry tomatoes, zucchini, and peppers in our garden this year so this is PERFECT 🙂 Not to mention, I’m obsessed with feta! Why an “oven safe” skillet? Is there a step missing, like putting it in an oven to finish? I made this last night & it was so delicious! My daughter’s friends walked in the door and said ‘it smells SO good in here!’ Everyone loved it, I stopped at the local farm stand to get everything fresh! I meant to take a picture because it looked so gorgeous as well…but everyone dug in too fast! I am so happy to hear that Eileen! Thank you!! Made this tonight … wonderful. The colors alone make this a winner. 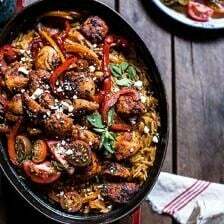 I served it over Carolina aromatic rice and it was spectacular. I’m thinking maybe of using baby or fingerling potatoes instead of rice next time … maybe par cooking the potatoes and adding them along with the zucchini or maybe adding them earlier and cooking with the chicken? I made this the other night and it was delicious! 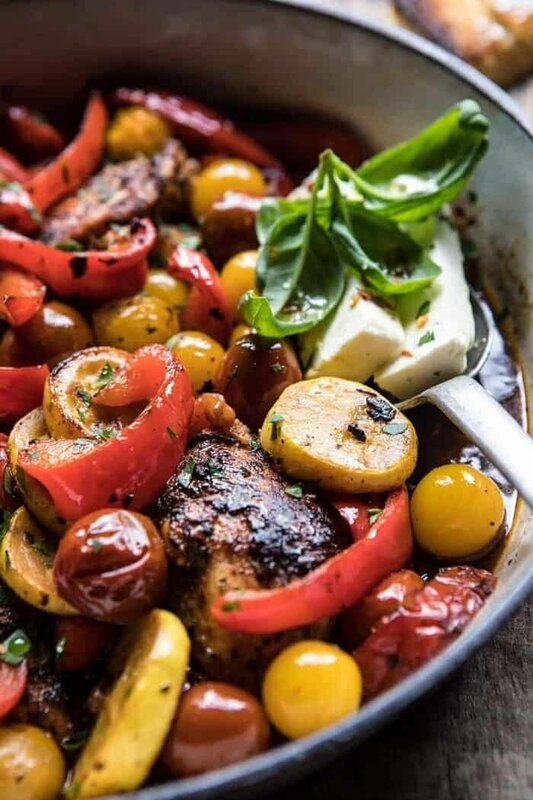 The flavors of the fresh herbs and smoked paprika, along with the lemon zest, created a glorious aroma, that lingered in the kitchen and sent co-workers stopping by my office the next day. I will make this again and again. I am so glad you loved this Mel! Thank you! Made this tonight and we are SO enjoying it! It is visually lovely and really delicious! Thank you for another great, easy and nutritious meal! Thank you so much Elizabeth! I am so glad you loved this recipe! Very good – both fresh and leftover (what little there was). Boneless, skinless chicken thighs worked well. Did cut back on the cayenne pepper to 1/4 teaspoon. My Florida garden supplied the fresh herbs, zucchini, and tomatoes. Don’t be jealous – my growing season is almost done and won’t start again until October. Sounds amazing though! I am so glad you enjoyed this! What do you recommend service g this dish with? 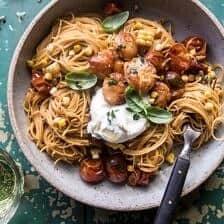 Orzo? I am so glad you loved this recipe Natasha! Thank you so much! Do you use thin sliced chicken breast or regular? At what point do you add the lemon juice? With white wine? At the very end before serving? Do you cut the chicken breast into large chunks? Hi Bianca, I used small chicken breast. If yours are large, try cutting them in half. I think that will be great! Please let me know if you have any other questions. I hope you love this recipe! Thanks! What happens to the bacon fat? Is the chicken cooked in it or is it discarded? The bacon fat is used for cooking the chicken. Please let me know if you have any other questions. I hope you love this recipe! Thanks! I have been following your blog for quite some time now and have made plenty of your recipes. You do such a great job and I will always be a fan of your work! However, I must say, this was my least recipe that you’ve posted. I think some of the ingredients were a little unnecessary. I don’t understand the part with the bacon? In the pictures, it doesn’t even seem like bacon is part of the dish? When I made this with my friends, we were all confused. Did you chop it up and add it to the dish? Was it supposed to be a sort of garnish? Also, it would be helpful to know what kind of wine would be good to put in this dish. My boyfriend and I were at the store trying to research the type of wine to use. It would be helpful to put 2-3 options just to inform the user what kind of white wine to put in this dish. Was the white wine necessary? Again, I am such a fan of your work! I am just trying to give you constructive feedback for a new beginner who just started cooking because specifics are important. I tried showing this dish off to my friends but we were all just confused. Thanks, Tieghan. You metion that there is bacon in the recipe in the intro, but it is not in the ingredient list or included in the recipe. Can you provide clarification? Thanks! Can’t wait to make this! Love so many of your recipes. What type of cookware do you generally use? Hi Emily! I generally use Staub cookware! Its my favorite! I made this for dinner last night and served on top of gemelli pasta- it was perfect! So satisfying and delicious, and also just really pretty! Delicious with just the right amount of heat. I had huge chicken breasts so I chunked them before cooking. This was perfect served over rice to soak up all the yummy sauce. Thank you so much Diana! I am so glad you loved this! Made this last night for my family and they loved it. Served it with rice. I may add mushrooms or olives next time. it was edible, so we eat it…$50 of food and such…. Could you substitute chicken broth for the white wine?? Hi Tieghan, I made this for my husband’s dinner and he absolutely loved it. 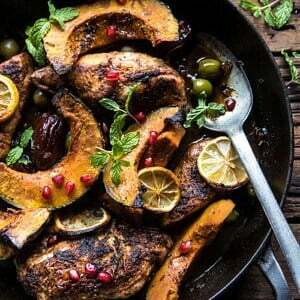 I love your recipes and all the details and the images are just beautiful. I always look for new recipes and I only came across your website recently when I was looking for the peanut butter acai bowl recipe and since then I always browse through your website. This morning I made blueberry pancakes and they were yummy. Thank you for all your recipes and taking time to inspire us. I am so glad you both loved this Marshaleen! Thank you so much! this was BOMB. i added some extra cayenne because i like spice and some orecheitte to make a little more filling for my fam. i didn’t have wine so i added in the pasta water and lots of extra herbs. SOOO good. i love the base sauce for the chicken in this recipe so much, thank you for sharing! I am so glad you loved this Marie! Thank you so much! I just made this today and it was so delicious! I will definitely be making this often!! So full of flavor, yet so easy and fast to make! AMAZING! Have made it twice now. Wouldn’t call myself a good cook, but this recipe was easy to follow and absolutely delicious! We’ve been fans of your work for a long time now! That’s why we believe it is important for you to learn more about our initiative “Feta PDO. Let’s get real” that has the mission to spread the word about the real origins of feta. We just want to ask you if it would be possible for you to accept from us a press kit with information about our initiative. Disclaimer: We are not representing a private label. Our program is informative only. Looks delicious! How do you get your chicken to sear so brown?! Mine sears but not to that coloring or look.